Romantic trulli villa, few min drive to Alberobello, UNESCO world heritage site, with its famous trulli, shops and restaurants, composed of two separate trulli houses for 4 people each with pool. The property is situated within acres of olive, cherry and fig trees, is surrounded by typical local stone walls and benefits from cooling breeze during the hot summer months. First trullo is composed of: fully equipped kitchen (with fridge-freezer, oven, coffee machine, toaster, kettle), small interior patio with sink, dining room with sofa, table and chairs, TV-SAT, DVD player, Hi-Fi, comfortable bathroom with washing machine, shower; 1 standard size double-bed bedroom, 1 standard size twin-beds (which can be attached to have a double-bed) bedroom. Second trullo: fully equipped kitchen with washing machine (with fridge-freezer, oven, coffee machine, toaster, kettle, fireplace, 2 separated single-bed alcoves with room dividers, 1 standard size double-bed bedroom, dining room with TV-SAT, DVD player, Hi-Fi, comfortable bathroom with shower. All furniture are equipped to a high standard. Ironwrought beds and lovely local landscape pictures complete the tasteful furniture. The wonderful local climate can be fully appreciated in the large outside patio area, the solarium area with sunbeds, table and chairs, the amazing pool, the barbecue, the nice array of flowers and plants, the typical olive trees with their strange shapes and other fruit trees. Many activities are organized for you. A welcome pack at your arrival will give you the first taste of this wonderful and enchanting land! I am Alberobello native and the love for this native town and its landscape have prompted my will to promote our wonderful land to an international audience. Together with my family and with the same love we have prepared our properties to the highest standard in order to host our guests and offer them the very best welcome. Now, with great satisfaction, I am proud to say that I manage our properties giving all my best to make our guests feel at home! I have inherited the property from my parents and grandparents. This is also why I take special care of it. Our property is a romantic trulli villa, 1 min drive to local town Alberobello, UNESCO world heritage site, composed of 2 trulli houses, 4 people each, with lovely pool. The property is situated within acres of olive, cherry and fig trees which we are happy to offer our guests; it is surrounded by typical local stone walls and benefits from cooling breeze during the hot summer months for a relaxing, unforgettable experience. No neighbors around but only the wind whistling among the trees. At easy reach you can practice golf or find sandy and rocky beaches, both isolated coves and places full of entertainments (open-air discos, restaurants, delicious ice-creams cafes and lots more). Our trulli villa has beautifully furnished living/dining rooms with TV, DVD player and Hi-Fi, well equipped kitchens with oven, large fridge/freezer, coffee/cappuccino machine, toaster, kettle. There are 5 cosy and comfortable bedrooms with double beds and twin beds. One of the houses has a lovely log fire. The wonderful local climate can be fully appreciated in the large outside patio area, the solarium area with sunbeds, table and chairs, the amazing pool, the barbecue, the nice array of flowers and plants, the typical olive trees with their strange shapes and other fruit trees. A welcome pack at your arrival will give you the first taste of this wonderful and enchanting land! Our guests can also enjoy many activities we organize for their pleasant stay. The bathrooms are equipped with hairdryer, washing machine, fluffy towels. This trulli villa has been made comfortable without losing its original structure. The pool can be viewed internally from the windows. Stereo HI-FI platform with Cd/radio-DVD. Outside, a wheelchair path has been created to help elderly/infirm to access the pool area. The setting is lovely and peaceful, you can hear the silence even being just a few min from the attractions of the nearest towns and cities. 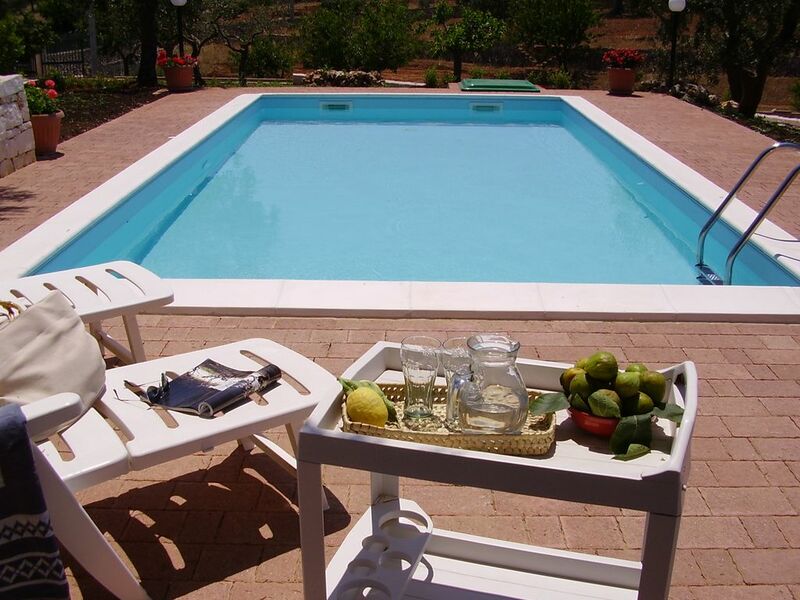 You can spend your sunny days swimming in the nice pool or just have a rest under the tree on the sunbeds or preparing at the barbecue delicious local food and eat near the pool and .... under the stars! We propose many activities for you !! We spent our holidays in Alberobello and we chose this wonderful villa: nice people received us, found beautiful and comfortable trulli and a lovely pool. This is the perfect place to relax and to visit the nice beaches and cities around. Thank you for such perfect holidays! Thank you for your kind words. Hope to see you again soon ! We stayed at this trulli villa in August and we can happily recommend it especially for the relax we have had there! The lovely pool has been a fresh relief in the hottest days. We will certainly be back soon! We look forward to meeting you very soon! Thank you very much for your kind words! Our holidays in this trulli villa have been the ideal accomodation for two families staying together but in separate houses. The pool is lovely and the big garden is well kept. Peaceful location and very easy to reach the cities around. We can warmly recommend this place and thank the kind owners: we will certainly be back! Thank you for your kind words and see you soon! We can only recommend a holiday in this villa where we have just spent a great period! Beautiful, clean, relaxing and very easy to visit wonderful Puglia. The pool was perfect in the hot days and we have had good assistance during our stay. We will certainly be back soon! Thanks a lot! Our villa is ready to host you again! Everything was perfect in our holidays here! From the booking time till our arrival and stay: the place is wonderful and relaxing and the host so kind and caretaker. The villa is clean, quiet, nice gardens and no noise. We will be back soon!! Thank you, Mike! We are waiting for you!! Thank you for a wonderful and relaxing holiday! we really enjoyed your lovely trulli and the warm reception we received from you! The kids loved the pool and we enjoyed swimming, sunning ourselves and taking in the lovely countryside. Thank you for the great cooking lessons ... we had a fantastic meal and learned a lot! The focaccia on our last day was the perfect way to end our trip and we will have fond memories of our week here in Alberobello. we hope to return in the future. Thank you! You have been fantastic guests. Alberobello , recognized in the world as the capital city of the Trullis, is also a beautiful town in its own right, always spotlessly clean, quiet and welcoming like its inhabitants friendly and warm. You will never be short of things to do in the town and surrounding areas. It is a great starting point for cyclists and walkers, artists and nature lovers alike.Beaches are easily reachable in some minutes by car (also a coach service is available ) and you are also well placed to go and visit the most interesting cities of Puglia region, with its architecture and history that characterize this warm and charming part of Italy. Spring and Summer are magic in Alberobello, with warm temperatures, entertainment, people, but you can also enjoy other periods during the year such as in September, with the traditional religious festival dedicated to “Santi Medici”, particularly spectacular and touching. Golf: The nearest parks for golf are in Savelletri, just 15 min drive. All prices include all costs of water, linens, towels, gas, electricity (fair usage policy applies). Heating is charged separately. We are authentic Alberobello natives but we speak English and we will be happy to greet you at your arrival and be on hand for any questions throughout your stay.